Fay Whitaker, sixteen years old and yearning for adventure, is excited to spend the summer with her fearless cousin Celia in small-town Juniper, Indiana. But Fay soon discovers that her summer home is not what she expected. She is alarmed by her uncle’s temper, and learns of the grudge he holds against the Dearing family. Celia handles the tension at home by escaping with her boyfriend, leaving Fay with time on her hands—time that leads her straight to Malcolm Dearing, off-limits because of his last name. Fay is captivated by Malcolm’s warmth and intensity. She finds that trying to stay away from him only makes her think of him more. Fay and Celia are launched on a journey, and each must attempt to navigate the thrilling and unpredictable world of love. Everything Fay thinks she knows about love is put to the test, as relationships unfold and reveal themselves in ways she never before dreamed. 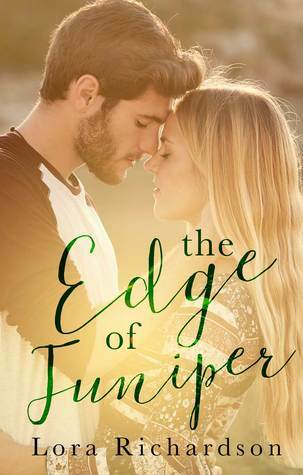 I seen The Edge of Juniper as a suggested book when I was browsing New Adult books on Amazon. I assumed that this book was NA because all the other books in the suggested page were so I bought a copy. It’s actually Young Adult, which is fine, but the second I realized that this book wasn’t the genre I was wanting, I was disappointed. That’s 100% my fault for assuming but it still hindered my overall reading experience with The Edge of Juniper. The main character is pretty young, 15 years old if I remember correctly, so I had a hard time relating to her. She was a nice character, I liked her, but she was also a little plain. She was an average YA character and she was kind of boring. There was a few things she did and said that was cringy and weird but it wasn’t often so it wasn’t that big a deal. The whole book was actually pretty plain and normal. There was nothing really memorable. I liked the characters, pace, and setting. The writing was good for the most part and I loved the family dynamics. But overall, The Edge of Juniper was a basic YA read. I liked it but I don’t think I”ll remember much about it in a few months. If you’re looking for a fun, quick read, this book might be for you. But if you’re wanting a book that will blow you away, you’ll probably want to skip The Edge of Juniper. Review + Giveaway for The Library of Fates by Aditi Khorana on the blog! Link in our bio! Taylor and Stephanie are both associated with Net Galley and are a part in helping books succeed!